Hi, I’m Robyn. My husband and I have been happily married for over 11 years, and we have three amazing children. Our lives are full and fun, and if you saw us careening by in our minivan we’d look pretty much like any other family you know. A couple that met, maybe, in high school or college, and seamlessly transitioned to the inevitable married-with-children ending. Except that our love story didn’t “just happen”—behind it was a lot of hard work! Friends would happily have introduced us, had our social circles intersected—but it took online dating to bring us together. Given our busy lives and demanding careers, our paths might never have crossed at all. I lived the single life in NYC for many years. And I believe that Hollywood's romantic comedies have given women unrealistic ideas about dating and romance—that you can hang out in Starbucks with a latte and magically bump into your future husband. Follow your heart is the underlying message of these movies, where everything always works out so well in the end. And it is a wonderfully appealing approach—assuming your heart is always accurate in its choices, and that you find yourself in an environment filled with appropriate, marriage-minded men. But following only your heart is not the strategy that worked for me—or for most of my (now married) clients. I'm not an advocate of just "getting out there" and going on lots of meaningless dates; that is a sure-fire path to burning out and giving up. I will show you how to be selective, identify character traits that lead to lasting happiness, and enjoy a lifetime of love and respect with a man who truly cherishes you. Approach romantic relationships in a relaxed and balanced way so that other areas of your life are positively impacted as well (work, family, friends, health). I trained with Ellen Fein and Sherrie Schneider of The Rules—women who originated many current best practices for dating coaching. I've spent almost 20 years studying dating and relationship rules. You really can use The Rules in a way that is authentic and emotionally nourishing. Aside from caring for my family, nothing gives me greater pleasure than helping my clients find the love they deserve. Are you ready to move your life in a new direction? 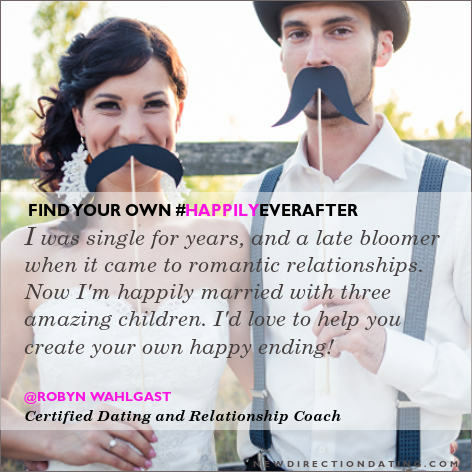 If you are a woman between the ages of 23 through 65+ I can help you date for marriage and lasting love. Explore my dating and relationship blog, check out my FREE newsletter, and let's connect on Facebook, Pinterest, and Twitter. Book a private consultation when you're ready to attract lasting, healthy love.